The General Services Administration (GSA) oversees the management of federal property, including Washington DC’s historic Post Office Pavilion. That building is currently being leased to Donald Trump for his new hotel. And as the Washington Post points out, it “presents unprecedented and intolerable conflicts of interest.” But the GSA insists that it doesn’t have any reports on that potential conflict of interest. Which I find surprising, to say the least. Yesterday, I filed a Freedom of Information Act (FOIA) request with the GSA asking for any reports they might have produced this year about Donald Trump’s potential conflicts of interest with the agency. As president, Trump will soon be appointing the new head of the GSA. And President Trump will have a direct financial stake in the decisions made by the new administrator of the federal agency, which has an annual budget of $26 billion. Amazingly, I got a response to my FOIA request today. I typically expect FOIA requests to take months or even years. But GSA sent me a response in record time, saying that it doesn’t have any records about Trump’s potential conflicts of interest with the agency. I’d love to say that it’s a testament to efficiency in government, but I don’t know how an enormous federal agency like the GSA could’ve done a proper search for files in less than 24 hours. Trump’s lawyers defend the president-elect’s right to maintain the lease. Trump has suggested he would step down before taking office, turning the company over to his children, Donald, Jr., Ivanka and Eric. But Trump’s adult children have been named to the president-elect’s transition team, thus eliminating any independence or “walling off” that might exist in other circumstances. And even if they don’t end up in the administration, having the president’s adult children negotiate with the staff of the president’s appointee at GSA presents what any reasonable person would view as the appearance of a conflict of interest. (This common-sense “reasonable person” test is frequently used to assess conflicts of interest). They also note that the president is exempt from many of the ethics rules that apply to other government employees. But the concern here isn’t about what the president may or may not do. It’s about what’s right. By keeping the lease, Trump puts his own employees in an untenable situation guaranteed to undermine the integrity — and the perception — of the procurement process. It’s been reported that, when 100 foreign diplomats convened at the Trump International Hotel last week, they heard a sales pitch about staying in the hotel to curry favor with the new president. 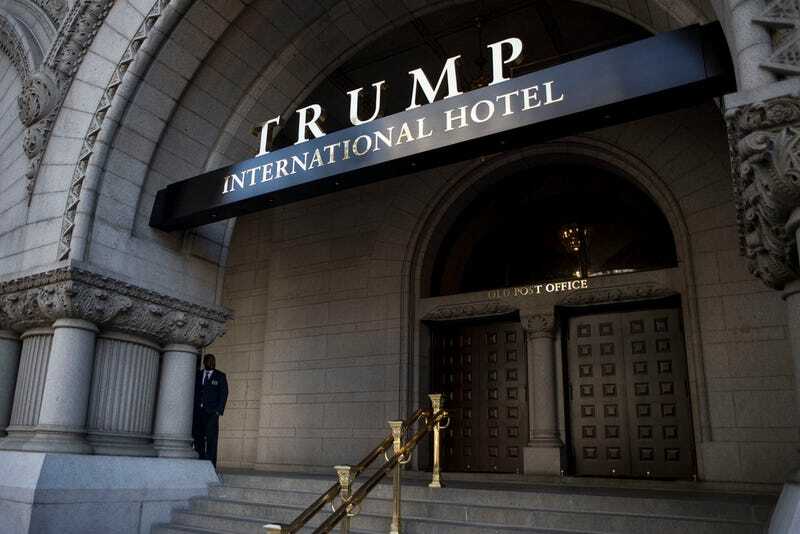 “Why wouldn’t I stay at his hotel blocks from the White House, so I can tell the new president, ‘I love your new hotel!’ Isn’t it rude to come to his city and say, ‘I am staying at your competitor?’ ” the Washington Post quotes one Asian diplomat as saying. The GSA’s insistence that they don’t have any records would’ve been a tad more believable if the agency had taken a couple of weeks to dig. I’ve truly never received a “no records” response in a single day. I’ll be appealing the decision and will let you know if I find anything, of course. But it could be even worse: The GSA may not have even addressed the possibility that the incoming administration has a conflict of interest. I’m not sure which is more horrifying.